Although 2017 was a year where altcoins became popular among cryptocurrency investors, Bitcoin remains the market leader and owns the largest share of trading volume. Bitcoin typically represents over one-third of cryptocurrency trading volume and with it being used as a pairing instrument, traders commonly switch to Bitcoin when exchanging between altcoins serving to drive the trading volume up even further. If you are an experienced trader, scroll down to the ‘Best Bitcoin Exchanges For Traders’ section to benefit from low trading fees and high exchange liquidity. Not all Bitcoin exchanges can be trusted to securely purchase the market leader Bitcoin. There have been enormous hacks in the past. In 2014, Mt.Gox, a cryptocurrency exchange platform, lost approximately 850,000 Bitcoin. More recently, Bitfinex, another Bitcoin exchange platform, was hacked for 120,000 Bitcoin in 2016. For this reason, we have taken security as one of the most serious considerations when putting together this review of exchanges. We have also delved into fees, tools, operations, team, and more to present you with the top five exchanges where you can exchange your Bitcoin. Before we do so, we will list the 2 best exchange platforms to help beginners get started with crypto trading. For beginners who want the process to be as straightforward and simple as possible, there are other exchanges which are suitable for starting out. If you’re thinking of buying your first cryptocurrency, whether it’s Bitcoin or any other, we recommend you to check out our ‘Making Your First Step‘ chapter guide to help you get started. The platforms mentioned in our ‘Best Bitcoin Exchanges For Traders’ section are more tailored for the professional trader who wants to avail of low fees. 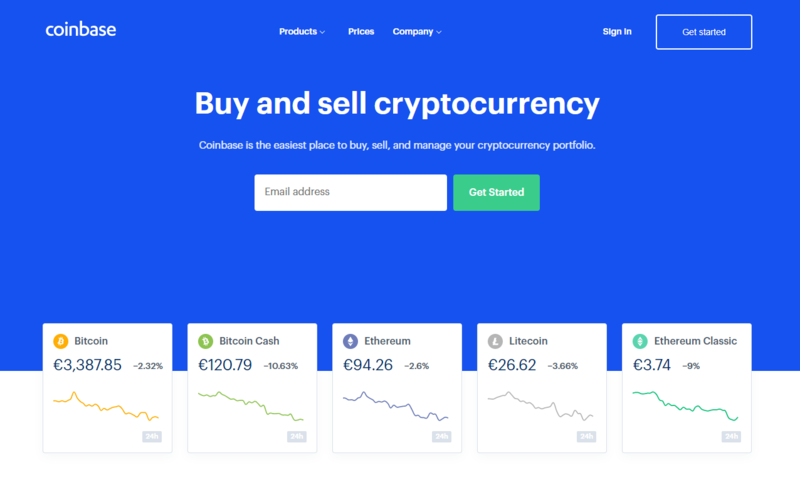 Later on we’ll have talked about Coinbase Pro, however, Coinbase also offer an online exchange platform where beginners can buy and sell cryptocurrency with ease. Coinbase’s traditional service is the most popular among beginners. The website is designed for those with no experience. Once an account is set-up, which will require some personal details such as a photo of your ID card (standard procedure on every exchange platform), users can simply choose the amount of Bitcoin they wish to buy and have a number of payment methods. Users can choose to purchase cryptocurrency through a number of payment methods. Users can deposit to their Coinbase account via banks transfers or wire transfer. There is also the option to purchase with a debit or credit card. The option to purchase with a debit or credit card is an attractive feature which is not offered by many exchanges. It makes cryptocurrency accessible to people dealing in a variety of different local currencies, including the Euro(€), Dollar($) and GBP(£). If you click here you will earn an extra $10, and so do we, upon your first deposit with Coinbase. There is a 1.49% fee on buying or selling in Coinbase. There will also be a 3.99% fee applied if a purchase is made with a debit or credit card. Although this is the most convenient option, it is also the most expensive. Despite the higher fees, Coinbase is the most popular exchange for a reason. It has a very secure wallet, insured up to $250,000, the user interface is sublime, and everything is easy to understand. For more info read our detailed review and guide. Coinmama is another exchange where users can use their debit or credit card to purchase cryptocurrency in a straightforward and simple way. When compared to Coinbase, it is slightly more expensive. Once an account is created, users can buy Bitcoin straight from the home page. Users are quoted amounts of Bitcoin for $100, $250, $1000, and $3000. 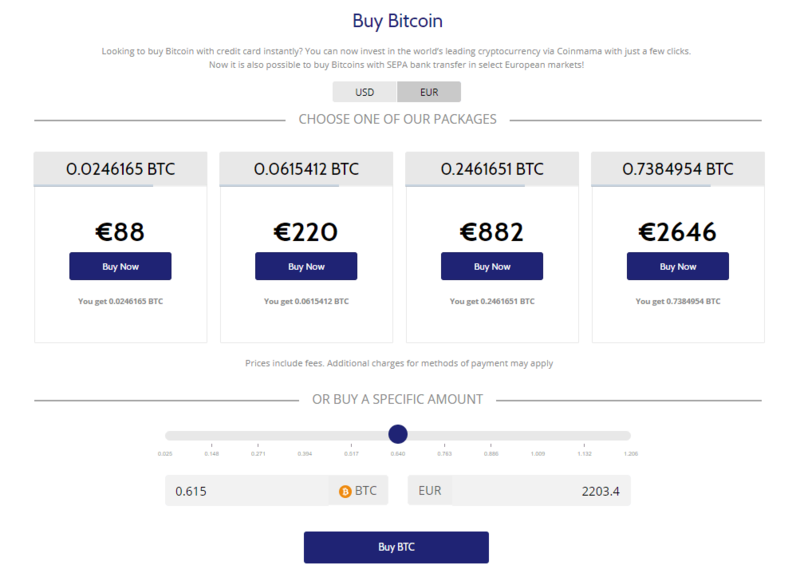 It is also possible to customise the amount of Bitcoin to be purchased. The quoted rate will adjust based on market movements. The quoted rate also includes Coinmama’s fee which equates to 5.9%. If users make the purchase with debit or credit card, a 5% payment processing fee will be additionally charged. This is not the best option if you are looking to save on fees but if you are looking to quickly and simply purchase Bitcoin, Coinmama is a good choice! For more detail, read our Coinamma review. Coinbase Pro has become almost synonymous with cryptocurrency. The exchange has been operating since 2012 and has pioneered numerous cryptocurrency products. The exchange displays a professional and intuitive user interface which makes the process for purchasing cryptocurrencies as straightforward and easy as possible. However, users have started paying a high premium in fees for this service with Coinbase being the initial exchange used by many first-time buyers. Not everyone is aware of Coinbase’s Pro service. Coinbase Pro provides a suite of tools targeted at professional traders and this is accompanied by a drastic reduction in fees. The fees are actually zero for market makers, which are traders that place limit orders that provide much-needed liquidity. There is a progressive fee structure for market takers, traders that place market orders, based on the amount of volume traded. It is also one of the most liquid exchanges for fiat trading. Data from Bitcoinity.org shows that the spread is almost always zero for Bitcoin traded against the USD and removal of vast sums from the order book will only result in slight increases in the spread. The removal of ten bitcoins from both the bid and the order, the equivalent of around $130,000 in October 2018 prices, would result in the spread increasing to 0.04 in the BTC/USD order book. 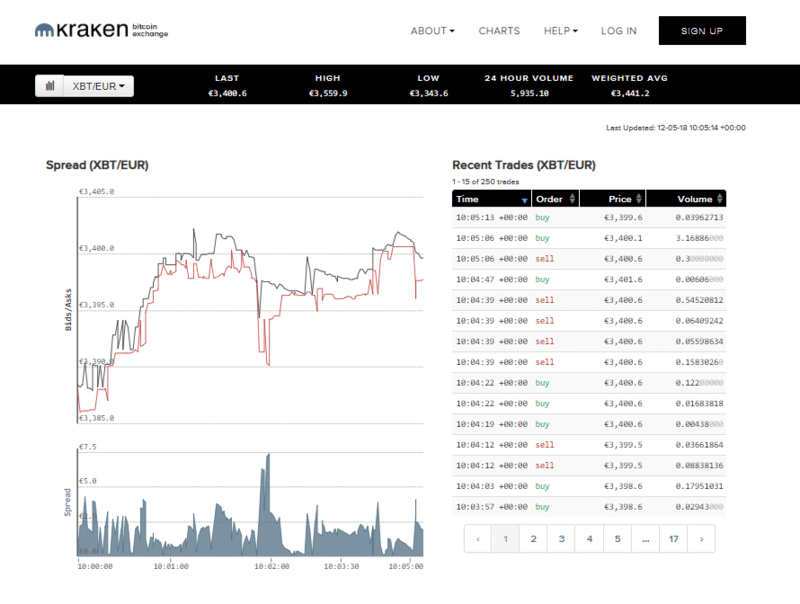 The suite of tools offered includes an order book, trade history, price chart, and depth chart. The products supported include Bitcoin, Bitcoin Cash, Ethereum, Litecoin, Ethereum Classic, and 0x Project. These can be traded against the Euro (EUR), United States Dollar (USD), or Great British Pound (GBP). Crypto to crypto trading is also facilitated and the exchange has announced upcoming support for Basic Attention Token. Within the crypto to crypto trading, users of the exchange can also trade between cryptocurrencies and USD pegged stablecoin USDC. Among the key strengths of Coinbase Pro are its suite of tools, its high amount of liquidity, and the trustworthiness it has built within the industry. One of the only drawbacks is there is still a limited amount of support for cryptocurrencies. As of recent, Coinbase Pro have been listing more with the recent announcements of 0x Project and Basic Attention Token. Coinbase also places a key emphasis on compliance. It complies with all the relevant regulations in the United States and the other jurisdictions in which it operates. The exchange has significant backing from investors and has recently completed its Series E round of funding which puts the company at a valuation of $8 Billion. Signing up for Coinbase Pro will require further identification than what is required when signing up for Coinbase’s mainstream service. Another United States based exchange, San Francisco headquartered Kraken is the world’s largest Bitcoin exchange in Euro trading. The exchange was founded in 2011 giving it a long history of operation. Kraken has been backed by a number of significant investors including Money Partners Group, Hummingbird Ventures, Blockchain Capital, and Digital Currency Group. It is a good exchange to consider for Bitcoin for a number of reasons. When you deposit Bitcoin or fiat currency with an exchange, it can be difficult to know what the exchange is doing with that money. They could essentially be doing their own form of fractional reserve banking where only a fraction of the money is kept and the rest is put to more risky use that may provide a return. Kraken conducts proof of reserves audits to communicate to clients that they have the reserves to cover all of the necessary balances. The vast majority of coins are also stored in cold storage offline which is a high level of security. For USD trading, the spread is 0.01 and if 10 Bitcoin were taken from the bid and offer, the spread would be estimated to be 0.11. The tools provided include order book, price chart, volume bar chart, and depth chart. Kraken also has a wide support for other cryptocurrencies beyond Bitcoin. The fiat currencies it supports include the USD, EUR, CAD, GBP, and JPY. 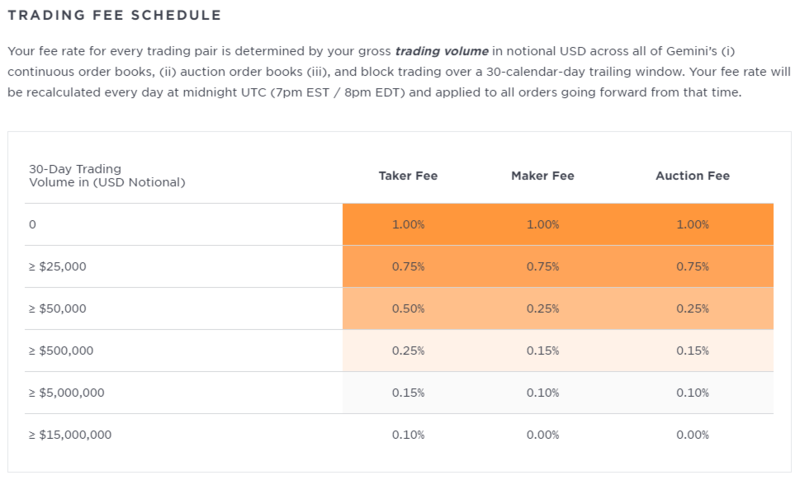 The fees can vary based on the liquidity of the product pair being traded but the vast majority of Kraken’s products have the following fee schedule. Although the maker fee is not as attractive as Coinbase Pro, this is overall an attractive fee schedule. One of the key features which Kraken provides that other exchanges don’t is the ability to go short for certain cryptocurrencies. Traders on Kraken can utilize margin trading to both increases their exposure to long positions or take short positions. The fees for margin trading range from 0.01% to 0.02% to open the position and 0.01% to 0.02% every four hours to maintain the position. Kraken is not regulated by the government. It participates in self-regulating organizations such as DATA and JADA. Kraken received some attention this year when it failed to comply with demands made from the New York Attorney General into its business operations. The key strengths of Kraken include its level of liquidity, being the largest exchange facilitating Euro trading, and its security measures and auditing practices. The regulation situation may concern some but Kraken has always been clear and communicative with its clients regarding any concerns. Bitstamp is a London based exchange which was founded in 2011. 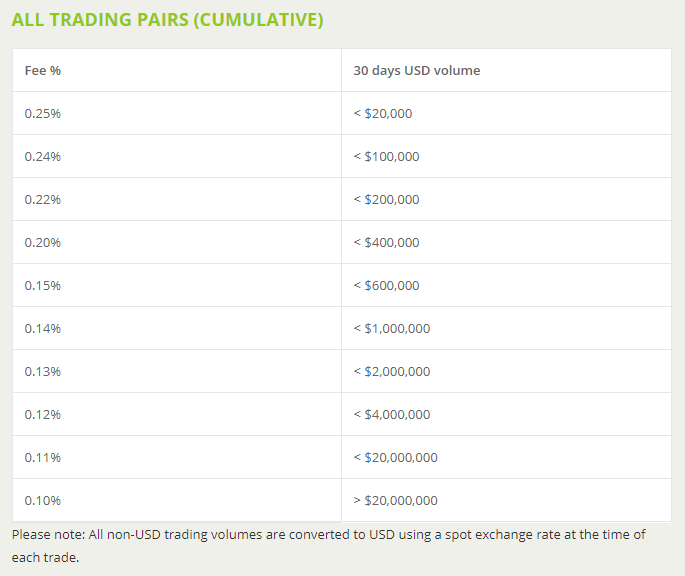 Bitstamp is one of the largest exchanges by trading volume and facilitates trading in both USD and EUR. Data from Bitconity shows the Bitcoin against USD order book at a spread of 0.03. The removal of 10 Bitcoins from both the bids and the orders estimates the spread would increase to 0.17. Bitstamp provides the same suite of tools as the other major exchanges. There is an order book, depth chart, price chart, and recent trades printing. Bitstamp has higher fees than its major competitors such as Coinbase Pro and Kraken. 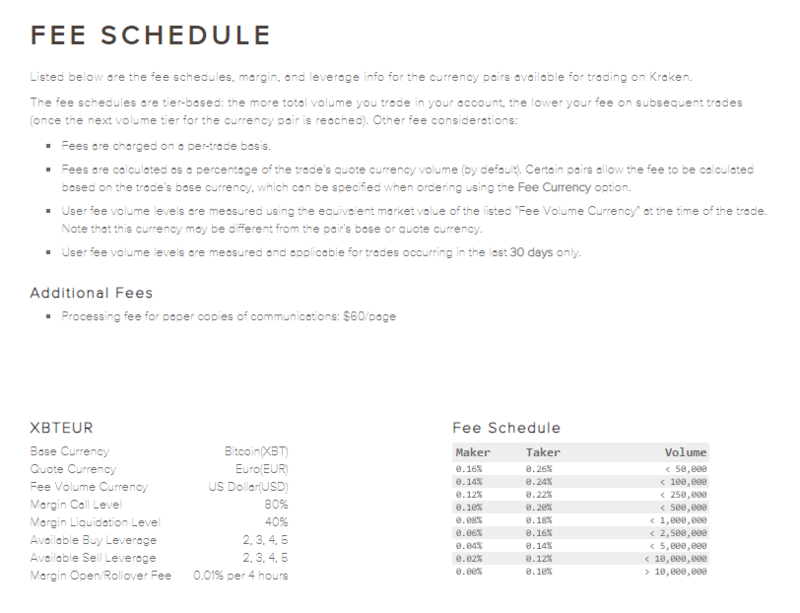 The below fee schedule shows the main fees for trading. There are also fees applied to deposit and withdraw. Bitstamp consulted with the UK Financial Conduct Authority regarding regulation and was informed that cryptocurrencies were not subject to regulation under its jurisdiction. Bitstamp now self-regulates and participates in practices to prevent money laundering. The key benefits of Bitstamp are its professional suite of tools and the high liquidity of the order book. The key drawback is the high fees compared to competitors. If your key concern is the ability to speculate with your Bitcoin, Binance is the place to do this. One of the key use cases of Bitcoin has been as a pairing instrument with altcoins. Binance is the largest exchange by trading volume and lists a wide number of altcoins paired against Bitcoin which enable traders to speculate with their Bitcoin. One of the key downsides is there is no support for fiat currency so Bitcoin will need to be purchased elsewhere and transferred to the exchange. Users can speculate on the price of Bitcoin in relation to USD by trading the BTC/USDT instrument which pairs Bitcoin against the USD Tether stablecoin. Binance provides a suite of tools similar to the exchanges listed above but the liquidity would be far less in some products. If traders are using Bitcoin on Binance to speculate on lower-cap altcoins, they will find a far different experience than trading on the above-listed fiat exchanges. 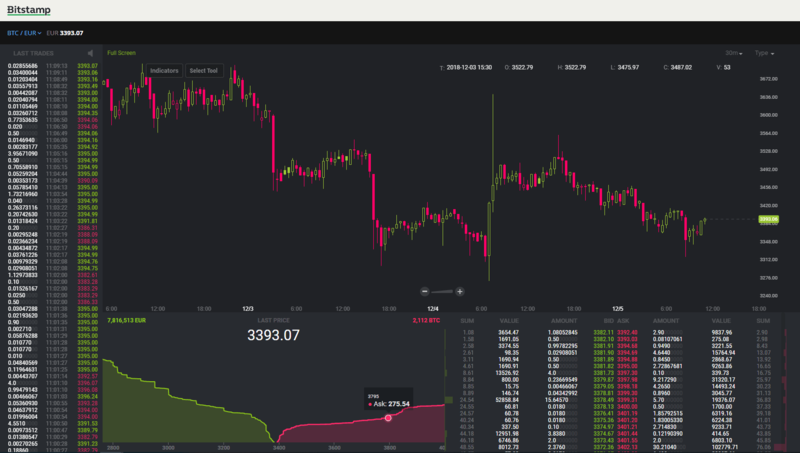 Nonetheless, Binance provides the tools a professional trader requires such as such as order book, price chart, and depth chart. The fee schedule for Binance is highly competitive. The fees start at 0.1% and get progressively lower based on trading volume and BNB holdings. BNB is Binance’s own cryptocurrency which was distributed during the ICO in 2017 when Binance was raising funds to develop the exchange. Holders of BNB avail of lower fees. With Binance not operating with fiat currencies, they remain largely unregulated. Binance has recently moved their headquarters to Malta to take action towards being more regulated. Malta is developing a regulatory framework for businesses operating in cryptocurrencies and it is likely that Binance will be compliant with these set of regulations. The key benefits of Binance are the ability to use Bitcoin as a base currency between different cryptocurrencies. The fees are also competitive with other exchanges and the exchange is the largest by trading volume. The main drawback would be the inability to trade with fiat currencies but Binance has announced that they will be adding this. Binance has also launched a partnership exchange in Singapore which facilitates Bitcoin trading with fiat currency. The regulatory position of Binance may also be a concern as there would be no protection in the event of a hack. For more info check out our Binance exchange review. Gemini was founded by the Winklevoss twins who are well known for their controversy regarding the starting of Facebook. Gemini is an exchange which is more tailored towards institutional clients. The fee schedule of the exchange is high unless clients are trading in multi-million USD amounts. The exchange has a strong emphasis on compliance and is regulated by the New York State Department of Financial Services (NYSDFS). In terms of liquidity, the exchange would be in the top ten. The spread for Bitcoin traded against USD is approximately 0.03. Taking 10 Bitcoin from both the bids and the orders would result in the spread increasing to 0.23. Gemini also offers other services such as custody solutions. Their exchange facilitates unique orders such as the purchasing of digital assets through auctions. The strong emphasis on compliance and security make it a tailored solution for large clients. It is definitely not the optimal place for the everyday user due to the large fees. To learn about investment techniques be sure to check out our ‘Investing Like An Expert In Cryptocurrencies‘ guide to learn about leverage trading, shorting, ICO investing and more.